ASC6050ZK Precise Vacuum UV Exposure Unit is equipped with special UV lamps and auxiliary vacuum suction device. Screen printing screens are coated with a light sensitive emulsion using a scoop coater. When the emulsion is dry, place your image with a positive print on the screen. Once you burn the screen, the emulsion that did not get any UV will wash out of the screen exposing the tiny pin holes. The surrounding areas that were exposed to UV will be cured. Hence the ink will pass through screen onto your substrate. 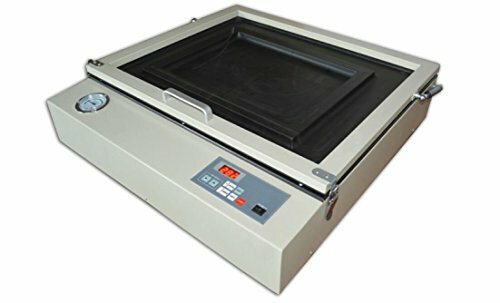 After putting the screens and well printed transparency film on the glass, close its cover and let it work after set the needed vacuum and exposure time, then it will make the screens and transparency film close on the glass tightly by evacuating the air of the vacuum charmer emerging from the rubber blanket. When the set time is up, it will deflate automatically, and then the exposure is finished. Please cut off the power supply. If you have any questions about this product by Screen Printing, contact us by completing and submitting the form below. If you are looking for a specif part number, please include it with your message.